Exploring how information is more fundamental than energy, matter, space, or time, Jude Currivan, Ph.D., examines the latest research across many fields of study and many scales of existence to show how our Universe is in-formed and holographically manifested. She explains how the fractal in-formational patterns that guide behavior at the atomic level also guide the structure of galactic clusters in space. She demonstrates how the in-formational relationships that underlie earthquakes are the same as those that play out during human conflicts. She shows how cities grow in the same in-formational ways that galaxies evolve and how the dynamic in-formational forms that pervade ecosystems are identical to the informational structures of the Internet and our social behaviors. 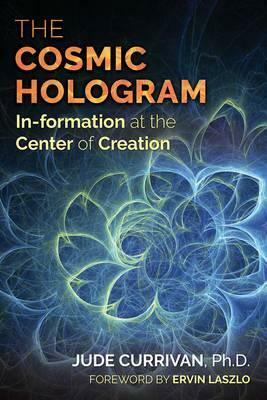 Demonstrating how information is physically real, the author explores how consciousness connects us to the many interconnected layers of universal in-formation, making us both manifestations and co-creators of the cosmic hologram of reality. She explains how Quantum Mechanics and Einstein's Theory of Relativity can at last be reconciled if we consider energy-matter and space-time as complementary expressions of information, and she explores how the cosmic hologram underlies the true origin of species and our own evolution. 11 Who Makes Our Perfect Universe? Jude Currivan, Ph.D., is a cosmologist, futurist, planetary healer and previously one of the most senior business women in the UK. She has a master's degree in physics from Oxford University and a doctorate in archaeology from the University of Reading in the UK. She has traveled extensively, worked with wisdom keepers from many traditions, and is a life-long researcher into the nature of reality. She is the author of 6 books, including The Cosmic Hologram, and is a member of the Evolutionary Leaders circle.